Imagine being on the cusp of stepping off a curb to cross the street when, suddenly, you see a car rapidly approaching. Being able to quickly cancel an incipient action, as in this imagined situation, is thought to depend on a network of brain areas that includes the subthalamic nucleus (STN, part of the basal ganglia) as a critical node. A widely-accepted current theory is that neurons in the STN transmit a stop signal that inhibits brain activity related to action initiation. This theory is clinically important because impairment of the stopping function may be a substrate for impulse control disorders. Surprisingly, however, single-unit recording evidence for such an STN role is sparse. Moreover, it has been unclear how that theory relates to well-established view that the STN is divided into segregated functional territories within which neural activity often correlates positively with limb movement per se, task switching, or proactive action control. In a recent paper in eLife, “A selective role for ventromedial subthalamic nucleus in inhibitory control” Benjamin Pasquereau and Rob Turner addressed those gaps in knowledge. Non-human primates were trained to perform a task that distinguishes reactive and proactive action inhibition, action switching and skeletomotor function. 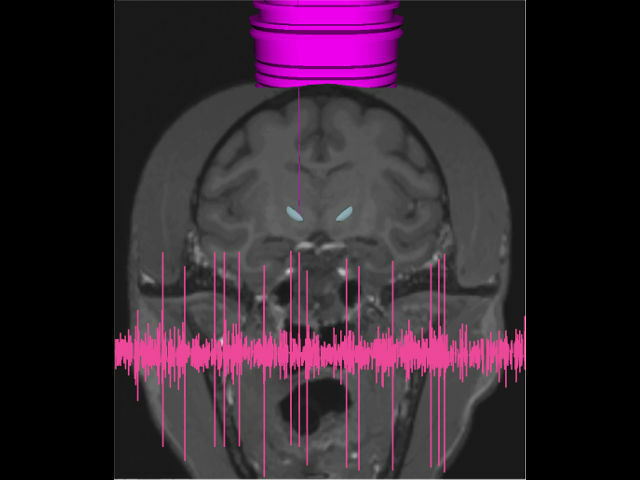 Single-unit neuronal activity was recorded from the STN during this task. 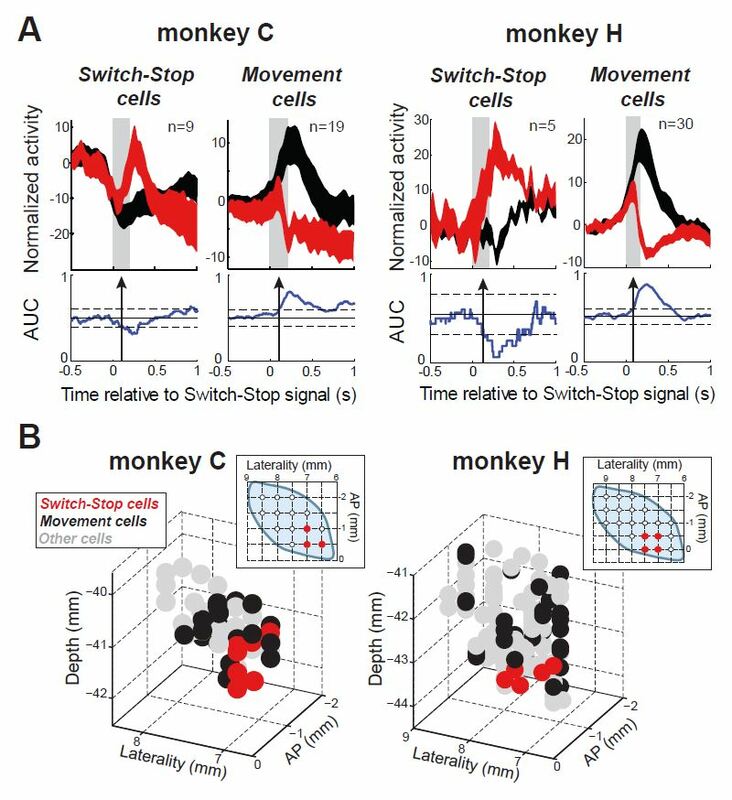 Pasquereau and Turner identified separate populations of STN neurons whose activity encoded action stopping and action switching. These neurons responded within the short time latency required for the activity to actually contribute to stopping and switching behavior. Remarkably, both of those neuronal types were restricted to the most ventral medial region of the STN, a region known to receive inputs from cortical areas involved in cognitive and limbic functions. In contrast, STN neurons with activity related to proactive action control and to simple movement were located in other more dorsal and lateral regions of the STN. Figure caption: (A) Population-averaged activities of STN neurons that showed a neural cancellation time within the SSRT. Spike density functions are aligned on switch-stop signal presentation (red) and the equivalent time in latency-matched go trials (black) were normalized by subtracting the baseline activity (500-ms before the signal) and grouped according to the response pattern evoked in neuronal activity during stopping: increase or decrease in firing relative to latency-matched go trials (Switch-stop and Movement cells, respectively). The width of the spike density function line indicates the population SEM. (B) Topography of cell types in the STN. Two- and three-dimensional plots of cell type distributions based on coordinates from the recording chamber. AP: anterior-posterior plane. These results bring into congruence several previously divergent views of STN function. Strikingly, observation of stop-related activity in a discrete anterior ventromedial region of STN provides support for the idea that this region of the STN may be an effective target for neuromodulation therapies to treat impulse control disorders such as OCD and Tourette’s.